From beach bars, shisha lounges, happy hours, drink deals, wine bars, rooftop terraces and more..
With its enormous television screen, regular BBQs and vast tables, this fourth-floor deck area is a perfect place to enjoy sports and socials in the comfort of a European garden-style terrace. VIEWS: Not much, truth be told. You’ll have your eyes drawn to the giant screen. FOOD: Proper pub grub, including burgers and regular BBQs. GO FOR: This is an excellent spot for big sporting events. VIEWS: The views (largely of neighbouring office buildings) aren’t the main reason to visit Dek on 8. Go instead for the happy hour deals, picturesque poolside setting and DJ sets. A year after it’s arrival, Nola is still consistently busy, regularly drawing in the drinkers and diners of JLT. Twin bars line the beach at this cool bar at Atlantis the Palm. The private cabanas, sofas and day beds make for great daytime loafing, while DJs and live musicians keep the party going after bedtime. VIEWS: Gaze back across The Palm and to the beautiful coastline as far as the eye can see. FOOD: Light and easy beach snacks. GO FOR: When you want a little atmosphere to your day by the beach. 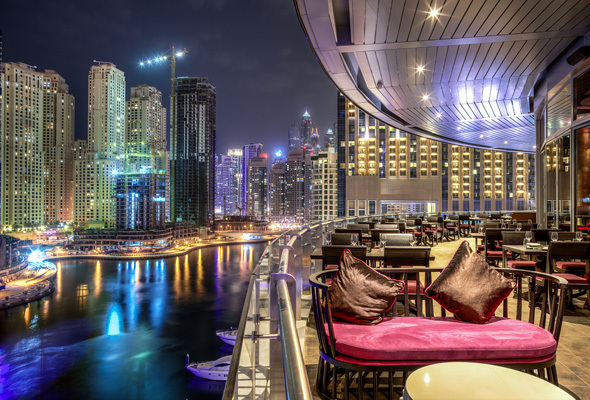 VIEWS: The distant Dubai marina skyline makes for a great backdrop. FOOD: This Ibiza-export does Mediterranean food, and it does it really, really well. 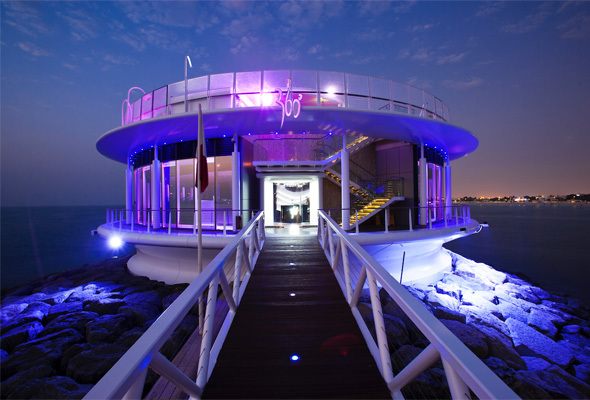 A classic Dubai spot, 360° is a circular venue located right at the end of the Jumeirah Beach Hotel Marina walkway. 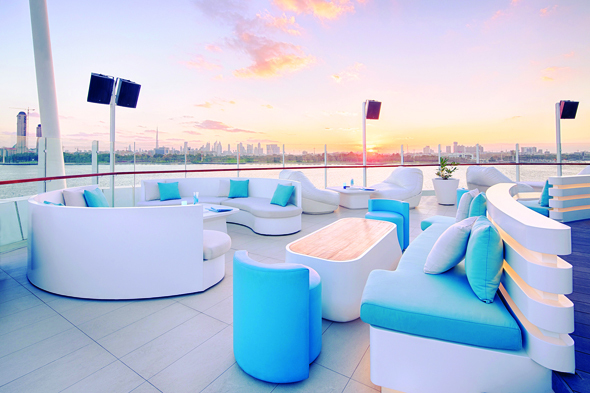 VIEWS: The rooftop bar and lounge is named for its panoramic views of the sea, the Burj Al Arab, and the city. FOOD: Bar bites and pan asian snacks. There’s also a new Friday evening brunch of pan-asian bites and unlimited drinks for Dhs295. A suave wine bar with over 400 types of wine, and corking deals. VIEWS: Overlooking the waterways of Madinat Jumeirah. FOOD: An extensive sharing selection. It’s all about the drink and atmosphere here. GO FOR: The terrific cheese nights, with a worldwide selection and fondue. GO FOR: Sunset and their fancy cocktails. They’re re-opening after the summer on October 10. Strut your stuff among the lawns, trees and waterfalls at this sixth floor Balearic-inspired pool bar. You’ll feel like you’re in the back garden of a rapper’s mansion. VIEWS: The whole point is to obstruct the view of the main road, which remains out of sight, earshot and mind. FOOD: Poolside snacks are top notch. GO FOR: A long afternoon beside the pool when all you want to do is switch off. Recharged, stay until the evening for things to get cranked up to party level. A canopy covered terrace lounge nestled inside one of the city’s most picturesque resorts. VIEWS: Gaze across the creek to the bright city lights beyond. FOOD: Seafood, salads and pasta dishes. GO FOR: Relaxed sundowners on a Saturday evening. This picturesque beachside bar is located in the same resort as Blue Marlin, but on the other side. VIEWS: There’s not a skyscraper in sight, and it’s got some of the best sunsets we’ve seen over the banks. FOOD: It’s a solid Mediterranean, BBQ style menu, but their Pizza’s come straight from the wood-fire oven and are hard to resist. GO FOR: Brunch, their rolling Friday brunch is a steal at Dhs199.